Lashbrook bands are a true piece of art with no two bands alike, making them perfect for the unique groom. 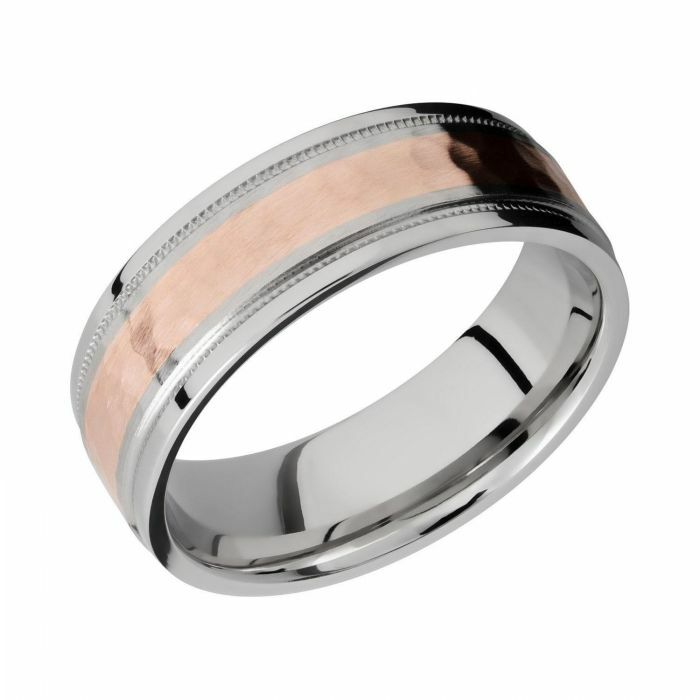 This 7.5mm flat band is crafted in cobalt chrome and features a 3mm 14k rose gold inlay along with milgrain edges. Cobalt chrome is a durable, lightweight, and hypoallergenic alloy that has the appearance of platinum. This alloy is best suited for the man who wants something they can work in without getting their ring scuffed up. Metal: CobaltCobalt: A silvery white metal that is very strong and malleable. Cobalt is an excellent choice for men's wedding bands, as it is less likely to scratch and is very durable. Cobalt - A silvery white metal that is very strong and malleable. Cobalt is an excellent choice for men's wedding bands, as it is less likely to scratch and is very durable.